Do you suppose when Ford Motor Company came out with the Boss 351 they even imagined that teams like Gapp and Roush would have the Cleveland running 8.70’s in Pro Stock? No one can argue with the success achieved by the Livonia, Michigan, Ford wizards. Their advances in racing engine development are second to none and they have one hell of an impressive track record to go with it. You’ve seen Gapp and Roush at the races. The World Champions had themselves a pretty good year in ’73 with their Pinto, and their new Mustang II and super-controversial Maverick four-door sedan arent’ doing all that bad in the Pro Stock wars this year. Gapp and Roush are true engineers in every sense of the word. They are thorough no-nonsense types who seem to keep coming up with new innovations to make Ford products fly. Their high-port 351 Pro Stock heads, front dry sump systems and complete racing engines and cars have made them the kingpins of Ford quarter-mile racing–and they have themselves one hell of a circle track clientele to boot. birthplace of Gapp & Roush Hi-Port Boss 351. Schoolcraft Road in Livonia is where the team calls home. Their shop, like their race cars, is no-nonsense. If you order a part, they either have it or they don’t. If it’s in stock, or they can get it for you, they let you know how soon you can get it right along with the price, and you can depend on what they say. 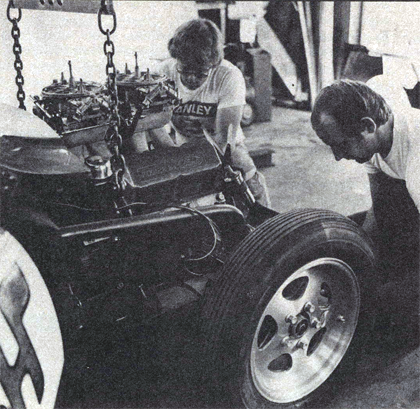 The Gapp and Roush operation proper began in early 1971, but Wayne and Jack’s involvement with engineering and racing goes back at least a decade before. At age 35, Wayne has behind him a degree in Mechanical Engineering from the University of Illinois and a number of years of service at Ford’s Engine Design Department. 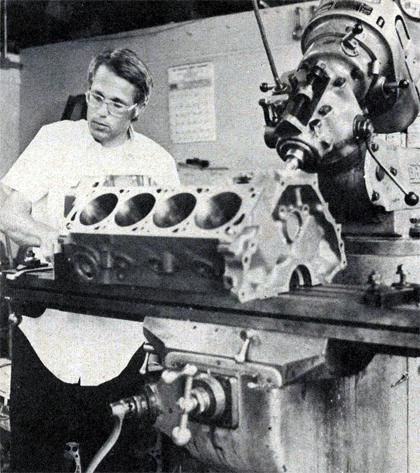 Among the many projects Gapp has worked on while at Ford are the 427 Cammer and the Boss 429 programs. His talent as an organizer which clearly shows in the current operation stems back to the days when he and a group of fellow Ford engineers belonged to an inter-company racing group called the “Hi-Risers”. Among Gapp’s duties there was at the wheel of the club’s race car – a ’65 altered wheelbase factory cammer Comet, one of the original five made. That was in 1966. It was Wayne’s first real race car, and the machine graduated from club car to match racer, and gave the Ford Engineer much of the driving lessons which would later pay off. The “Hi-Risers” club eventually fell apart, but continued to race. He then built a ’67 Cougar Funny Car. The injected machine was cammer powered, and alternated between gasoline and nitromethane according to the need. The Cougar made the rounds for a couple of years, and was then replaced by a Logghe-chassied ’69 Mach I Mustang powered by a injected Boss 429. The Mustang did quite well, and mid-season was sold to Drake Viscome who was also quite successful with the car. With the sale came the decision by Wayne to return to heads-up racing. Prior to Roush’s meeting with his partner, the 32-year-old engineer in Mathematics and Automotive Engineering worked for both Ford and Chrysler in various engineering facilities. Jack belonged to a counter racing group at Ford called the ‘Fastbacks’ and he was on a number of different projects. 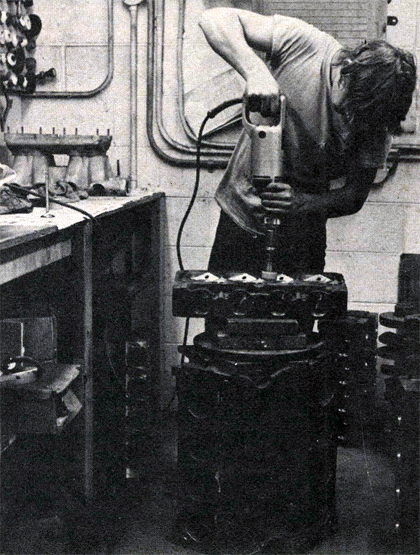 Roush’s engine building talent was put to good use in prior years before the G&R alliance. Jack is plenty sharp when it comes to assembling thundering racing engines. The team’s original effort was a heads up and, then legal, Pro Stock Maverick called the “Shotgun Express”. The Maverick was powered by a Boss 429, and ran consistent 9.70’s. This was at a time when the Boss motor was under much attack by everyone. Many people stated that the engine was poorly designed, the ports were too big, the heads a nightmare, etc., but Gapp and Roush took their engineering skill and made the Boss 429 run, and they are to this day the Number One authorities on the engine. “Shotgun Express” Number 2 came about in early 1972. This car, also a Maverick, ran 9.50’s and it was one of the original Ford team cars on the United States Racing Team. But ’72 was the year of the Jenkins Invasion, and G&$ knew that the Boss 351 and the Pinto would have to be the way to go in the future. The team built a fairly mild Pinto for mainly R&D research. The car ran quite well, and taught the team a lot. In fact, it also turned out to be quite a winner at the hands of Gapp and the car’s second owner, Bob Glidden. Tube frame cars came into necessity in ’73, and the team brought a new Wolverine-chassied Pinto to the West Coast for the NHRA Winternationals. into the Maverick for the Summernationals. Caption: An inside look at the G&R operation. The team cars are getting ready for a big race. 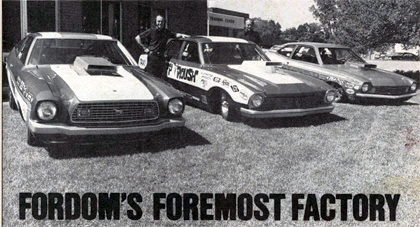 Caption: The first Mustang II, on it way to Low ET at Gainesville (9.02), and runner-up with Roush at the wheel. Unpainted, the car ran quite well, and finished the race three weeks later fresh and in paint. The car then went to Gainesville where it set Low E.T. of the meet (9.02), and was runner-up to Nicholson. From there on it was races like the World Championships, the NHRA Supernationals, the Pop Hot Rodding Meet and a bunch more. A trip to Gapp and Roush Performance is indeed a experience. From out of engineering came a winning team, and from a winning team came a thriving business. Out of Ford Motor Company’s “Better Idea” program came the Boss 351 engine and out of the 351 came the Gapp and Roush “Better Idea”.